Bet She'an (Arabic Beisan) lies athwart the easiest route of passage from the Jordan Valley to the Mediterranean and for this reason was an old city by the second millennium, B.C. The Egyptians at that time made it an administrative center, but the ruins visible today are Roman and adjoin a massive hill containing the site's older, still buried ruins. 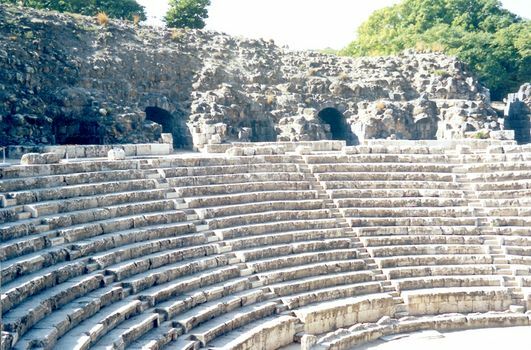 Destroyed in an earthquake in the 8th century, the Roman city was abandoned until modern times until the Turks built a railroad from Syria to the coast and logically chose to follow the natural highway. By 1900, the town had grown to 2,500 people. The view here is along the main street of the city and toward the mostly unexcavated hill beyond. The modern kiosk protects a Byzantine mosaic. The building behind it once housed the largest bath in the country. 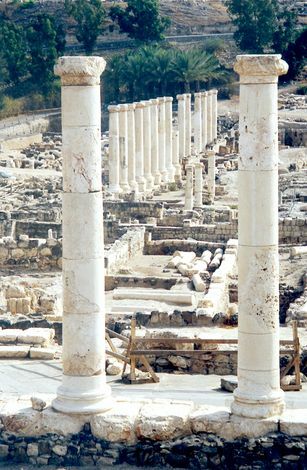 Residents needed it: at some 400 feet below sea-level, this was perhaps the hottest Roman town in Palestine. 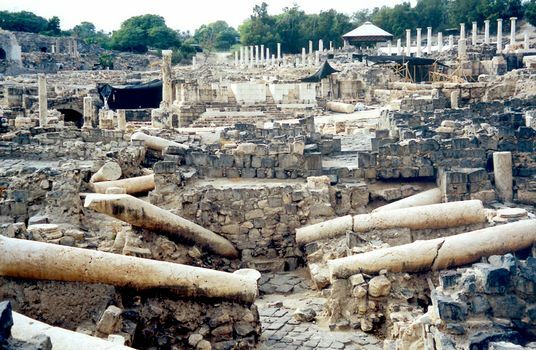 Looking east from the same vantage point, past two of four columns that were part of the Temple of Dionysus. The columns in the background were once reflected in a decorative Roman pool. Once this theater could seat 7,000 on three tiers. The top tier is gone, however, and the middle tier has lost its seats. 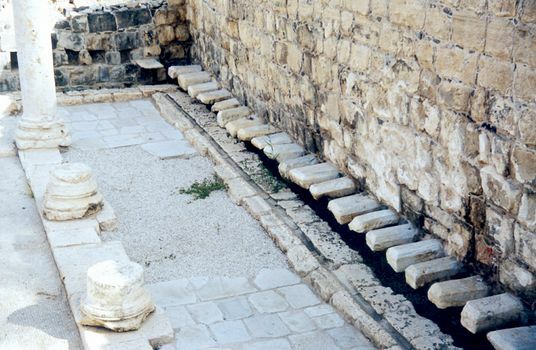 Latrines flanking an eastern bathhouse and also serving theater patrons. 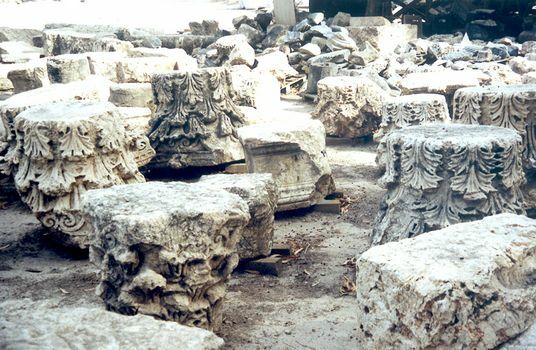 Assorted capitals scattered in a storage yard. 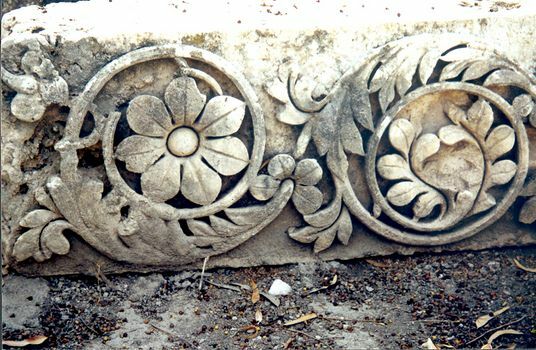 Floral details on a stone in the same storage yard. 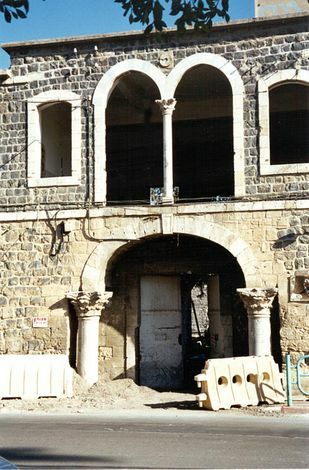 In the adjoining modern town, a 19th century Turkish administrative building rests in part on handy Roman columns.